Arabs deny the Temple(s) even existed. There is no archaeological proof they claim. It is the "alleged" Temple and is fabricated. 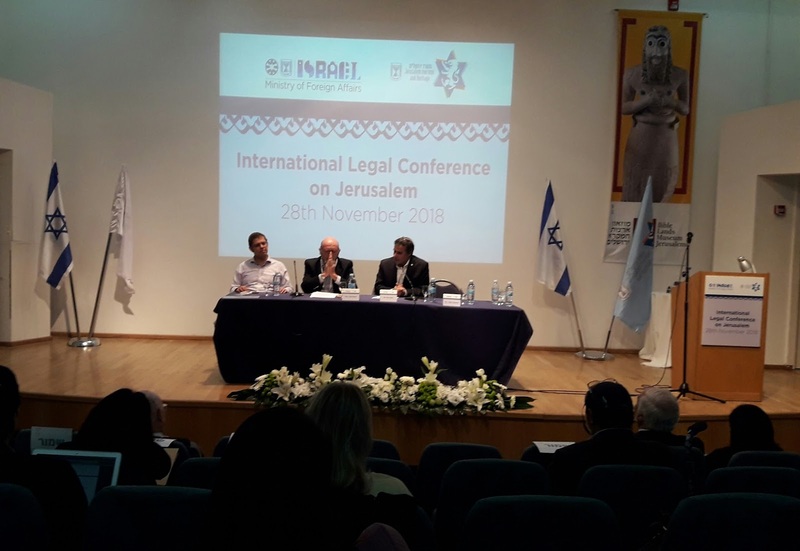 Jewish history in the city of Jerusalem is denied. Is there any proof a winged horse, al-Buraq, was tethered to the Western Wall? And we'll ignore what was that wall. Is there any proof that Abraham, sorry, Ibrahim, built the first mosque? Any proof Muhammed was in Jerusalem, in reality or in a vision? In a section of the Washington Post entitled "Global Opinions", there's an op-ed - 70 years after partition, a two-state solution is still possible - composed by David Makovsky (who I know well). 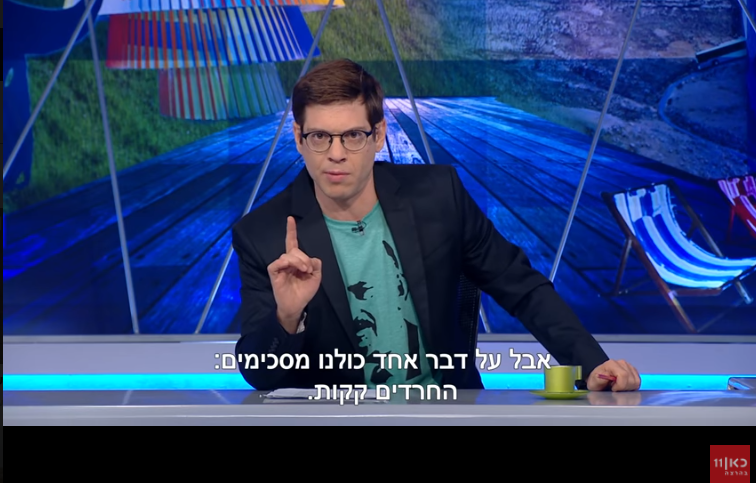 It isn't too late for a two-state solution. Bringing the land into focus proves it. just under 556,000 Israelis living inside, or west, of the security barrier and more than 97,000 living outside of the barrier. in a two-state solution, there were an agreement between Israelis and Palestinians regarding the relocation of these settlers, the prospect of relocation would become increasingly difficult...Israel needs to align its settlement policy with a two-state approach that enables Israeli-Palestinian compromise...None of this suggests that the barrier would necessarily be the border in a final-status agreement. That border would remain to be negotiated by the parties. The term "relocation" is employed. As an aside, at least it is not "resettlement" with its historical echoes.I have but one question: do Arabs get relocated, too?Can parts of the Wadi Ara population be relocated?Or is it only Jews?Besides the question, I would suggest that Makovsky's plan would have a better chance to prove itself if it would proceed incrementally. For example, first, an updated Begin-era autonomy/self-rule plan. Then a federation-with-Jordan plan. These would prove to all that the Arabs desiring an independent state of Palestine indeed have the desire, capability and wherewithal to maintain a state structure and its administration, halt incitement, stop terror, initiate peace programs, begin joint normalization projects, etc. Something has to be done other than creating ideas to undo 20 years of what the Palestinian Authority has wrought. 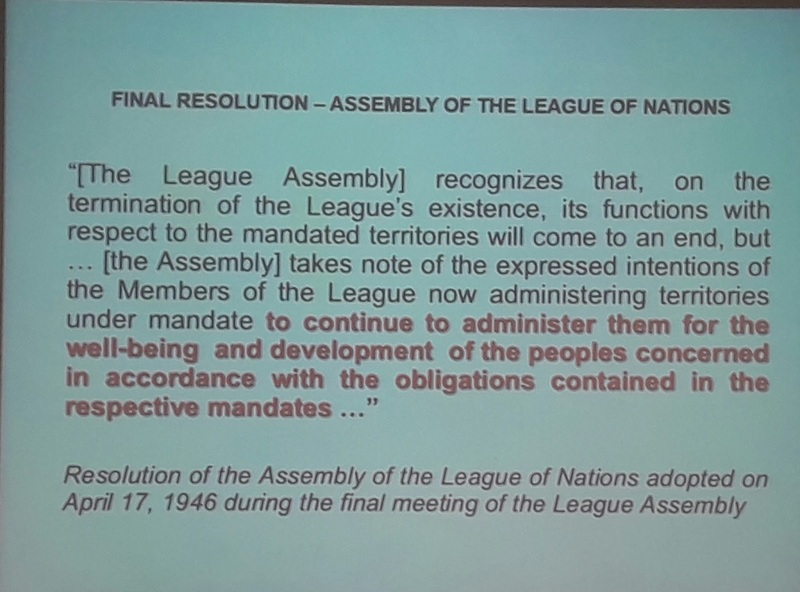 Whatever the "solution", let's not forget that there was a Palestine Mandate. 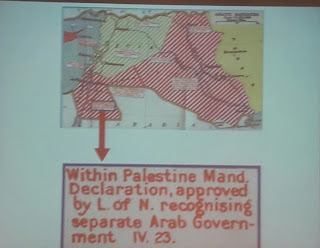 In 1922, the two-state solution was done and Jordan, geographically 75% of historic Palestine started off on its road to be an Arab state.The two-state solution was tried in 1937 and the Arabs refused.Again in 1947, and refused.A war by Arabs in 1967 was launched when no "occupation" existed nor were there any "settlements" as Jews had been ethnically cleansed from Judea, Samaria and Gaza (aka, the "West Bank" and Gaza) between 1920-1948.Has Makovsky solved those problems which caused the Arabs to reject the two-state solution previously, which would then facilitate a two-state solution today? In addition to its regular news programming, Kan has a variety of new shows coming to the air...The satirical show The Jews are Coming will migrate from IBA to air on Mondays at 10 p.m.
On Thursdays and Saturdays at 10 p.m. viewers can tune into Ad Kan! (Up to Here), a satirical current events show in which six panelists – three who consider themselves left-wing and three right-wing – argue about topics of the day. It airs actually now on Tuesday evenings. Last night they had a monologue which, in part touched on the very annoying Peleg group demonstrations. 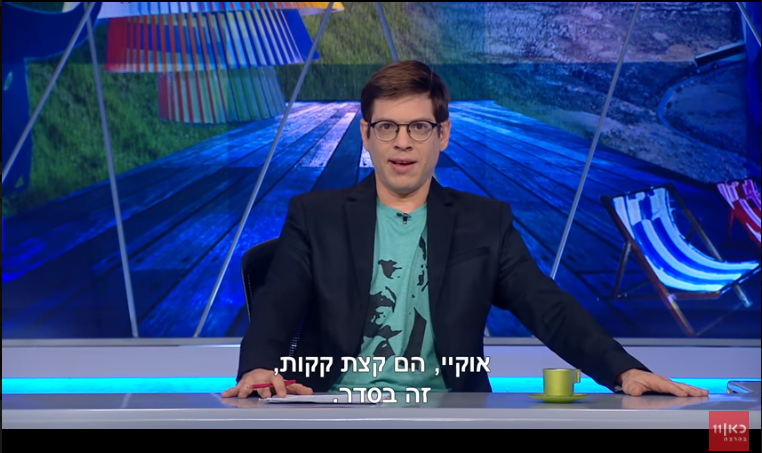 But this allowed a swipe at all Haredim, as the Ultra-Orthodox are called. On one thing we can all agree: the Haredim are turds. but one thing we're all in agreement on is that the Haredim are turds. 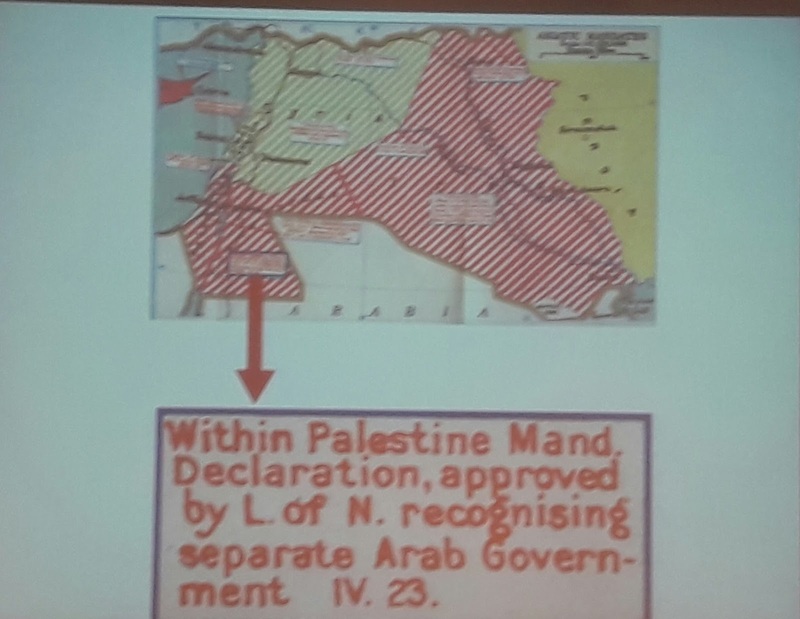 The Arabs Rejected UN Partition Proposal. Who Else? 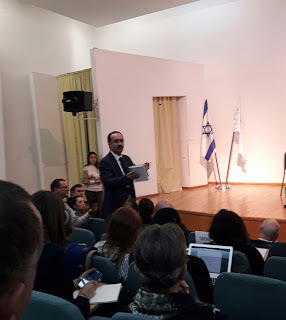 I participated in the Foreign Ministry's Legal Conference on Jerusalem today, Tuesday, at the Bible Lands Museum. What I wish to highlight was the lecture of Dr. Jacques Gauthier. 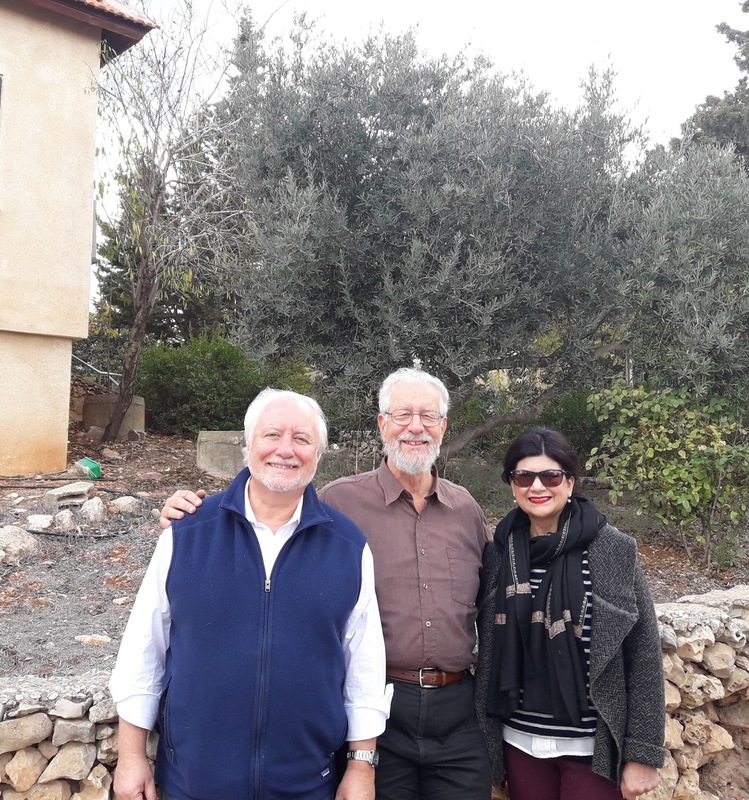 His research is an amazing contribution to the area of law and national rights, alongside my dear friend Howard Grief. He traced out his 1300 page PhD dissertation (details here) in brilliant form and some highlights I include below. 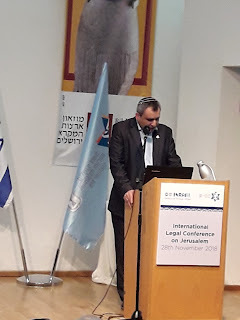 This follows the concept that Jewish natural, historical and legal rights pre-existed the diplomatic events of World War One and were of a level that were recognized as having precedence over other communities of people residing in the territory of what was acknowledged as the Jewish National Home. 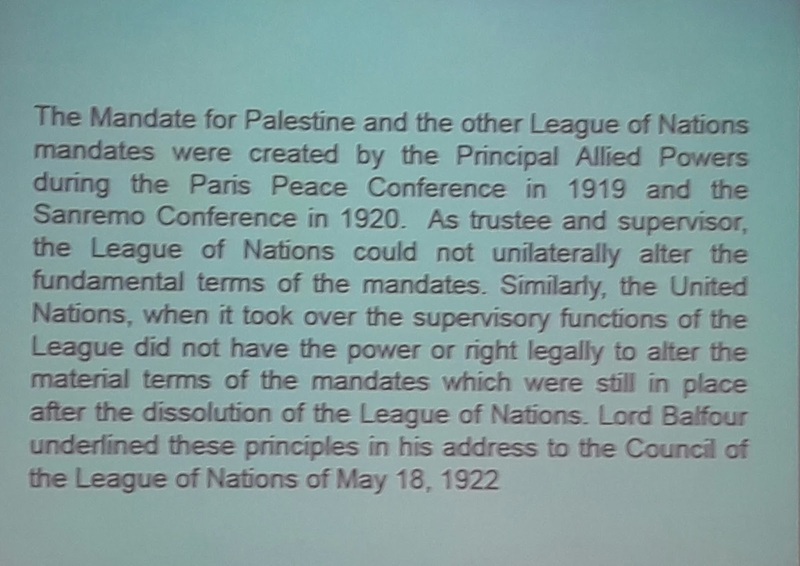 Britain not only objected to the UN partition resolution, it also refused to help implement it or even to permit UN observers to prepare the ground for the partition - rejecting official UN requests.7 This British refusal was largely motivated by self-interest - to avoid damaging its relations with the Arab states that had overwhelmingly rejected the 1947 partition. 7 Yapp, op. cit., pp. 114-115; cf. Laqueur, op. cit., pp. 97-98. Jordan administers the Temple Mount. Israeli violations during the period of the closure of Al Aqsa Mosque/Haram al-Sharif by an unjust Israeli government decision on Friday, July 14, 2017 and was followed by a series of arbitrary security and provocative measures that led to the prevention of the guards and employees of the Jerusalem Waqf from entering Al Aqsa Mosque/Temple Mount for 14 days during which the police and occupation authorities vandalized in most of the chapels and facilities of Al Aqsa Mosque. ¨The occupation authorities and their military and technical devices planted iron screws in multiple parts in the walls of the Dome of the Rock, and these iron screws are believed to be monitoring devices and photography. Explorations were carried out in various parts of the Dome of the Rock, including removing a tile from inside the cave, then attempting to return it, taking a sample of the rock in two places, and spraying a white material on certain parts of the rock, indicating that the closure was not as security as planned...Tampered with carpets and the opening of electricity fountains and tampering with them. (B) The tribal chapel:The occupation authorities installed screws on the wooden writing boards in the 40th place. A fragment of a marble piece was also seen above the door and in the lower corner of the painting...The carpets were removed, the door was broken and the stone cover of the channels was broken.All the minarets in Al-Aqsa Mosque and Omar Mosque were opened and tampering with them. ¨ The occupation authorities broke down and opened all the electricity cabinets and tampering with several reconstruction committee and opened a stone slab of water channel covers on the surface of Marwani. ¨ In the cradle of Issa was removed part of the marble terrace of the Nativity as well as the effects of digging beside the Nativity. ¨ The occupation authorities carried out a hole in the upper part of the door on the eastern side of the wall. The occupation authorities removed an ancient stone plaque on the roofs of the Dome of the Rock from the south, and tried to return and carried out many explorations in the bases of Albuayak, and confiscated some of the chemicals used in the laboratory manuscripts and school laboratories and the confiscation of electronic bags students. ¨ The occupation authorities messed in the ear [amplification? broadcasting?] room and the alarm and communications room, where he lost some electronic pieces, which are accurate and expensive and stolen a video camera and tampering with the computers of the audio room. 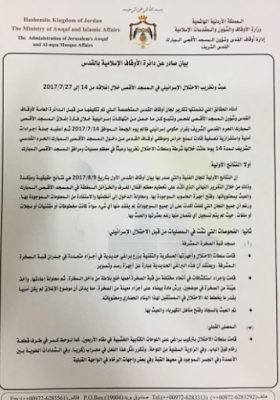 But the plan to affix surveillance cameras inside the compound, as initiated and suggested by King Abdallah and agreed upon by Israel and the United States, has not been implemented. If I had the time, one way to spend it would be to review in depth the Haaretz line-up this year for the centenary of the Balfour Declaration, and even include some from previous years, to show the paper's utter contempt for Zionism. the racism of the British government 100 years ago, which disturbingly, continues to reverberate in the conflict to this day. 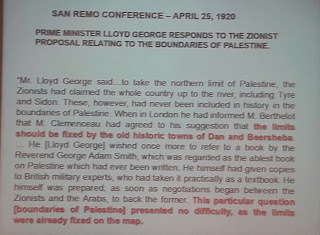 The British government’s interest in the weapon of supposed Jewish power far outweighed their concern with the future of Zionism in the Holy Land.They did not engage in any wartime planning regarding the development of "a national home for the Jewish people." British Orientalists saw the Palestinian population, instead, as an impure mix of different races, who were not 'authentic', 'racial' Arabs. 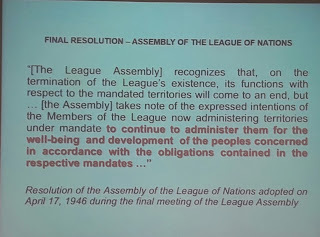 This was why the Declaration invoked the phrase "non-Jewish communities" to describe the Arabs who constituted approximately 90% of the population. If Ken Livingston and crew accuse Zionism of collaborating/cooperating with Nazism, well this predates Zionism's "sins". 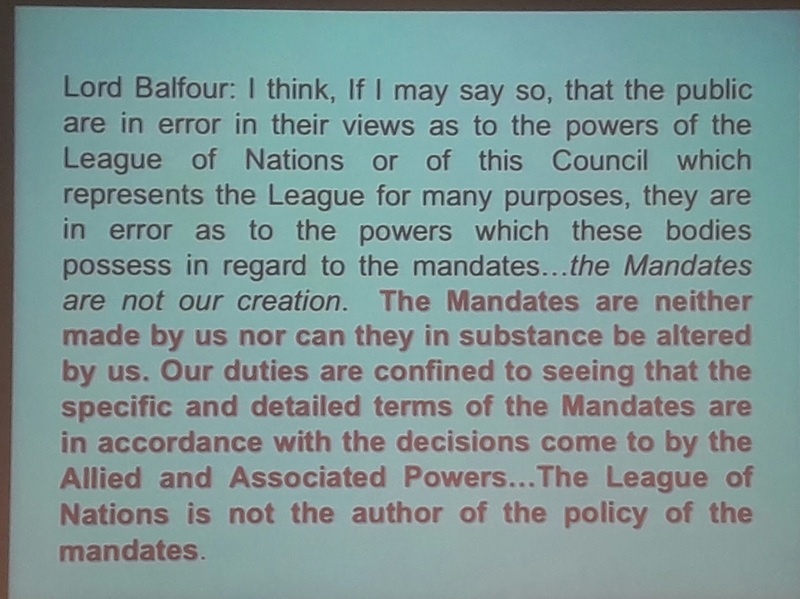 Britain's Broken Its Promises to the Palestinians From Balfour Onwards. Oh, there were some good ones. Here. Here. And here. Even here. The paper, however, was negatively overloaded, and I am not inclduing the "news" stories on the events and how they spun out. Zionist history, a la Haaretz. "From the perspective of the Jews, the advantage of Mohn’s map was clear: It gave the future Jewish state 62 percent of the territory of the land, even though demographically the Arab population was double that of the Jews"
Always turning a Zionist disadvantage into an advantage! 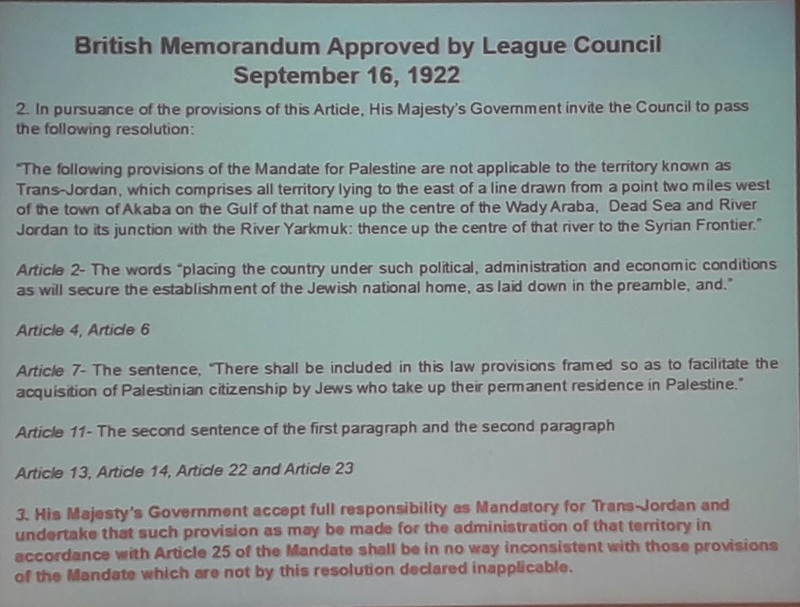 In 1922, Transjordan removed, actually postponed or application withheld as per Article 25, from the terms of the Mandate. 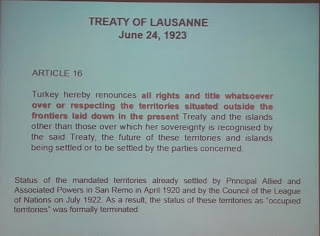 In 1937, a first partition suggested with other versions over the next year. 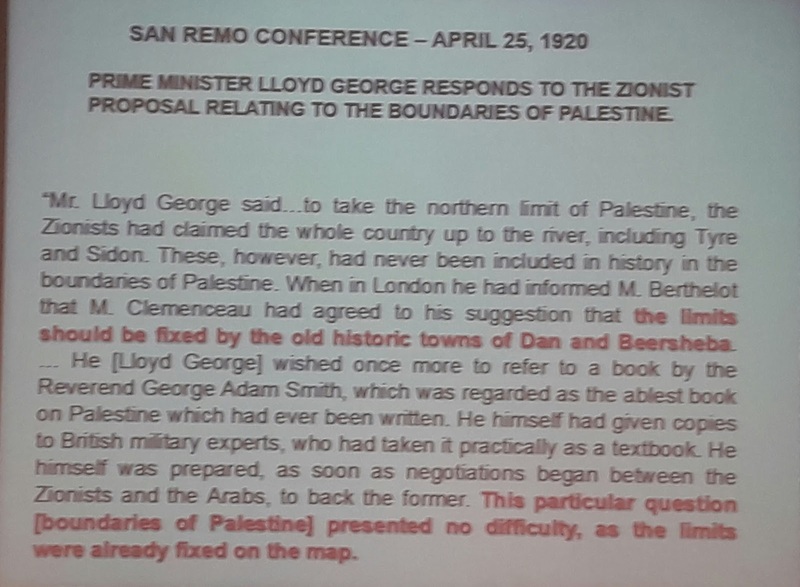 In 1939, a British White Paper reneges on the original intent of the Mandate, to reconstitute a Jewish homeland in, at least, all of Western Palestine. And as for that Arab demographic item above, many tens of thousands, perhaps hundreds of thousands of Arabs were no less 'recent immigrants' to Palestine than the Jews. And most of them illegal as well. While, on the one hand, at least Israel isn't accused of occupying Gaza in centuries ago, Gaza was part of the Land of Israel and even part of the Mandate territory to become the Jewish national home. 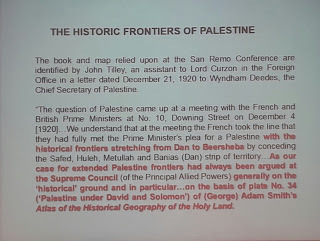 Let's be clear, the Jewish connection to Gaza, in various forms and over many centuries, was strong. Up until 1929, when a small community of Jews there were expelled by Arab terrorist pogroms and later, when Kfar Darom was overrun in 1948. The territory that the tribe of Judah received after the Israelites entered the Land included Gaza (Joshua 15.47), yet they failed to occupy this area at that time (Joshua 13.3)...Gaza was conquered by King David about 1000 BCE. His son Salomon ruled over Gaza (I Kings 5.4), but its population seemed to remain Philistine. 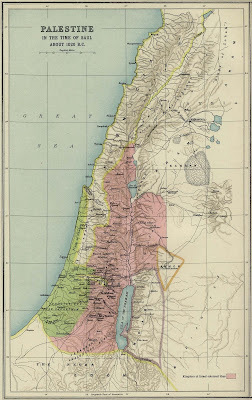 The Northern kingdom controlled Gaza after the United Kingdom was divided. The city was subsequently attacked and reconquered by Jonathan the Hasmonean during 145 BCE (1 Macc. 11:61-62). During the Hasmonean civil war, the city was taken by Alexander Janneaeus in 96 BCE. The Roman Pomey restored the city and Galbinus, also a Roman official, rebuilt the city (circa 57 BCE). King Herod the Great held the city for a short time, but after his death, it came under the authority of the Roman proconsul of Syria. A synagogue existed there 1500 years ago. Whether Jews ruled the area and just resided there, wiping out the Jewishness of the territory is not proper journalism. 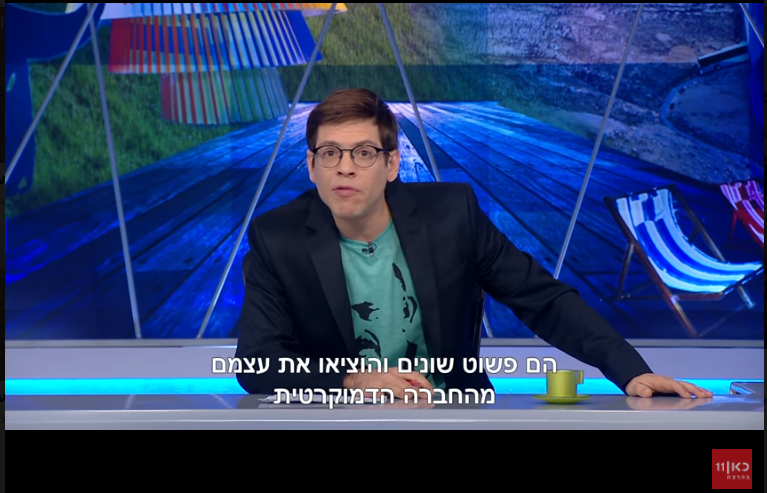 "I’ve been part of the Jewish cultural world all my adult life and I’ve seen how anti-Zionist Jewish voices are being blocked from different institutions." He is dribbling rubbish there. He is suffering from DISS. It undermined and crippled Jewish national thought and action in generations past: by ultra-Orthodox, Bundists, assimilationists, disappointed human rights activists, embarrassed Jews, ASHamed Jews and a host of others. Do You Suffer from DISS? DISS is DIasporic Supremacist Syndrome. It seems to have invaded the ideological, psychological, societal, cultural, religious and intellectual genes of a growing number of Jews, most of them Jewish establishment types and our normal rebellious children (see here). If it does not cease or come under control, in a generation or two, those contaged will cease to exist as Jews. In the meantime, DISS sabotages and undermines the proper existence of the Jewish national home. So, yes, if those suffering DISS insist on interfering in Israel's affairs, not because you are a citizen, or pay taxes or serve in its armed forces, but out of identification and commitment, know well that we have the same right to interject our views into your conversations. Beinart, on the other hand, hates the current elected Israeli government so much that he is willing to take the position that the murder of hundreds of thousands of Israelis is really not that big a deal just to criticize a human rights icon for daring to speak out forcefully in favor of Bibi's defending the lives of his people. 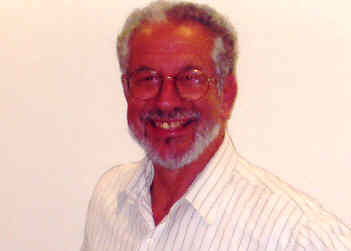 I have read the Jewish Chronicle item on Ethan Saunders' intervention of the talk by Dr. Hirsh. I am not sure he is this Saunders (whose account info suggests we read Norman Finkelstein's The Holocaust Industry). As I wasn't there, I am treading on loose soil but the sound of that conversation is all too familiar. 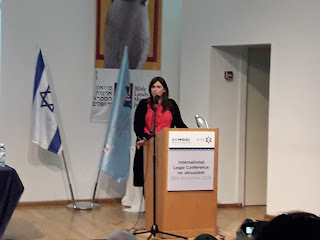 It is that of a voice of a radical and even extreme anti-Zionist or, to be fair, a politically leftist progressive Jew who rejects Zionism, prefers socialism, will champion the Diaspora over a Jewish national home. Of course, he could be psychotic in his hatred for his own Jewish identity. Let me be short, as you may have some homework to do or after-school sports to engage in. a) one can never tell the whole truth. So, it's up to you to read and be as informed and knowledgeable as possible. I don't mind telling you never to trust any teacher completely or any lecturer. Always check, even me (and with Google, you can do that in the classroom while he/she is talking). b) as for Menachem Begin being a terrorist (oh, by the way, he was awarded a Nobel Prize for Peace which, I must admit, was also awarded to Yasser Arafat), he also could be a "militant", or a "guerrilla leader" as even the NYTimes notes. Or perhaps a "revolutionary". I prefer freedom fighter. 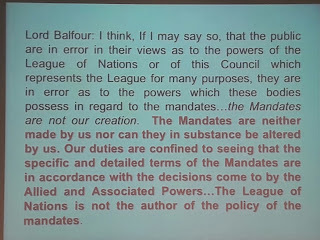 Be that as it may, please, study the history of the Mandate and especially the British White Paper of 1939 and ask yourselves, was Great Britain complicit in the preventing of Jews fleeing Nazi Europe by shutting the gates to immigration, thus contributing to Hitler's "success" in killing so many who couldn't get out? 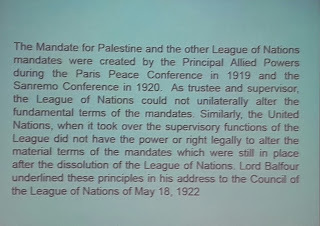 Did England renege on the terms of the League of Nations Mandate and instead of a Jewish national home in the Jewish people's historic homeland, it decided to alter its purpose and afford preferential treatment for Arabs, many who had illegally entered the country seeking employment, education and health benefits in the only really developing Middle East country at the time (and today, too)? Could those be good reasons to wage a war of liberation against an oppressive regime? As for Sabra and Shatilla, nothing sinister there. Begin had no basis to believe Israel's allies would act as they did. And the Fallangists were the sole direct responsible party for those killings, Arabs by Arabs. c) Regarding the Transfer Agreement (HaAvarah), even the Independent carried an op-ed demolishing the theory of Zionists "collaborating" with Nazis. Even Haaretz's radical Chemi Shalev knows that. Even the Guardian. Edwin Black wrote a book on it. Do you really think Jews worked together with Nazis, except to find a way to get out of the hell that was Nazi Germany? And here in The Fathom, Paul Bogdanor's article, An Anti-Semitic Hoax. “on 16 January 1937 [well before Hitler, in Livingstone’s estimation, ‘went mad’] the Reich Minister of the Interior informed the German Foreign Office that it was planning to continue to support the policy of Jewish emigration regardless of the destination countries [including Palestine]. 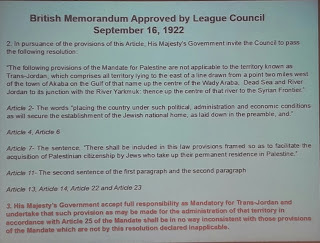 But after it began to emerge in early 1937 that Britain’s Peel Commission might opt for a Jewish state in Palestine, on 1 June the Foreign Minister, Neurath, sent guidelines to the embassies in London and Baghdad and to the Consul General in Jerusalem in which he made it crystal clear that he was against the formulation of a Jewish state or ‘anything resembling that state’”. In other words, and not surprisingly, the Nazi Party was not happy, in the words of Longerich, with the idea of “an internationally recognized power base for world Jewry”. d) in bringing up these topics, this teacher simply wants to play mind tricks on you. Don't let him. The facts are available. Be careful of ideological spins. You can always write to me and I'll help you overcome your doubts and befuddlement. I now see that there are petitions up (here and here; UPDATE: they are down) and that a slightly different account of the exchange was published. As for the petitions, I am all for an investigation which may result in a no-finding or a reprimand, suspension or termination of employment. In any case, the issue is one of education and the pupils must be made aware that questioning and doubt is at the heart of learning processes but not purposeful undermining by unfair presentations of fact and history. 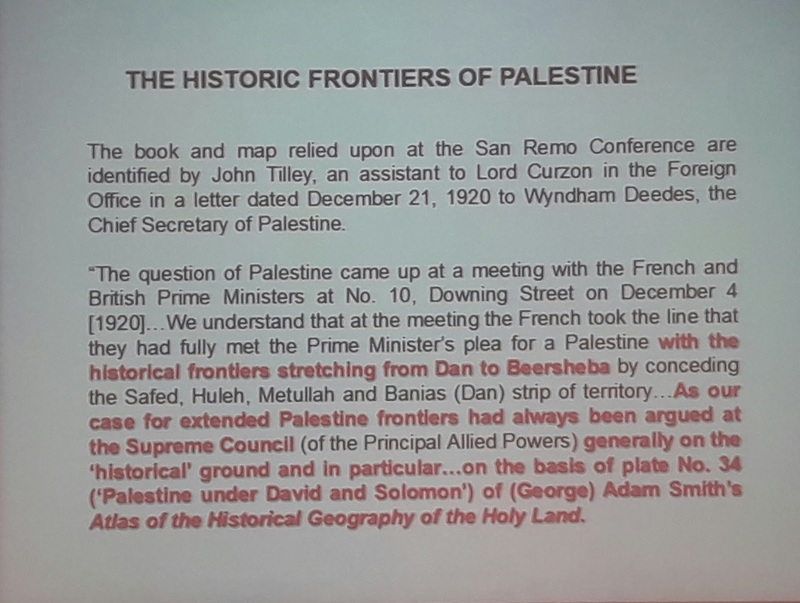 teacher had mentioned the Ha’avara Agreement “merely to add context and point out the possible fallacies in Dr Hirsh’s presentation”. 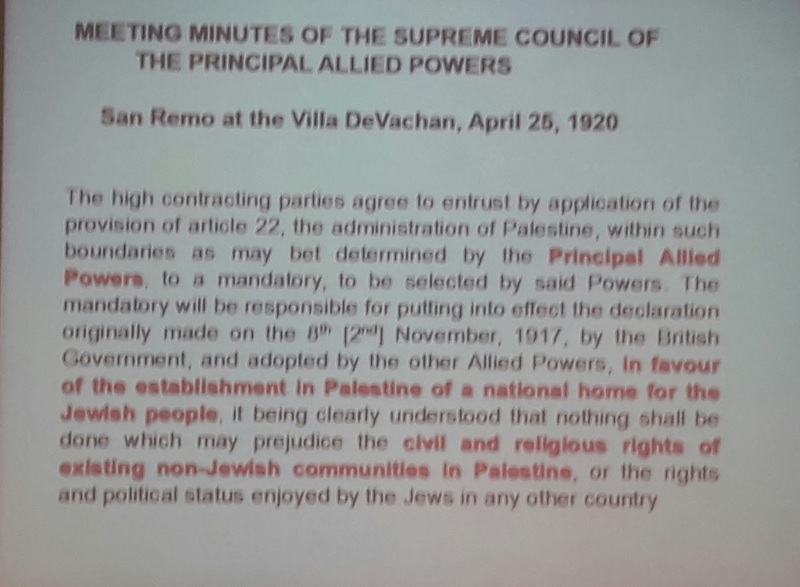 Let us be clear here: mixing in the Ha'arvara Agreement to save German Jewry be entering into a forced economic arrangement with Germany in 1933 (!) 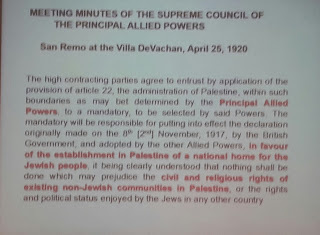 , despite it being opposed, for example, by the Revisionist Movement as Ze'ev Jabotinsky had called for a boycott of Nazi Germany in March 1933 which was sabotaged by assimilationist Jews in power, into a debate whether there was Nazi-Zionist cooperation is more than playing around with semantics. Saunders, even if he only did that was committing an error of grave proportions and injuring his pupils ability to learn, to discern and to comprehend complex historical situations. Again, if true, he was playing mind games with them. And those corrupt. 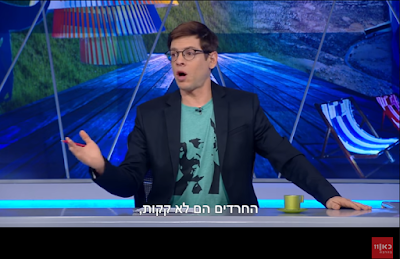 There are no fallacies in Hirsh's argument, which I heard recently in Jerusalem, that anti-Semites use that issue to confound and pervert. is that the approach to Jewish history can be patchy and unsystematic. if the JFS controversy does highlight one thing, it is that Jewish history should not be an add-on, it should be an essential component of the curriculum in Jewish schools. Is anything happening of an investigation or is JFS hoping we'll all forget? 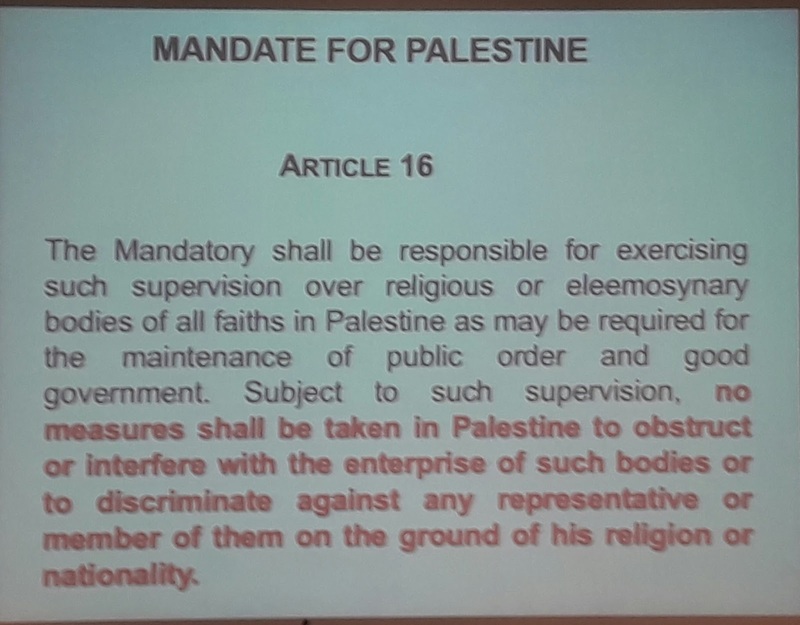 "Dr Yaqoob told Varsity that, while the University’s definition of extremism was “vague”, the training did not “directly state” that opposition to Israeli settlement in Gaza, for example, could be considered “extremist”." There are no "settlements" there. Israel removed them in 2005. It didn't satisfy the Arabs who call themselves Palestinians who continue to shell Israeli civilians, dig terror tunnels and refuse to make peace. 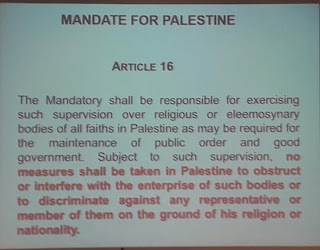 In fact, Hamas which rules Gaza (and is trying to take over the rest of the area) doesn't acknowledge the right of Jews to live anywhere in the area. I think that is quite extreme and to promote further Hamas rule is extreme. 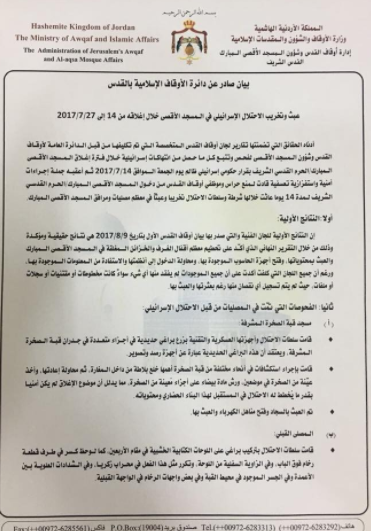 The Executive Committee of the World Council of Churches, meeting in Amman, Jordan, on 17-23 November 2017, has heard of the ongoing struggle of the churches of the Holy Land, and particularly of Jerusalem, for the future of their communities and witness in this region. In particular, the Executive Committee has heard with concern from the heads of the churches in Jerusalem of the ways in which church institutions and properties in Jerusalem are threatened as a result of a combination of contracts of disputed legality, the efforts of radical settler groups, and policies of the Government of Israel. 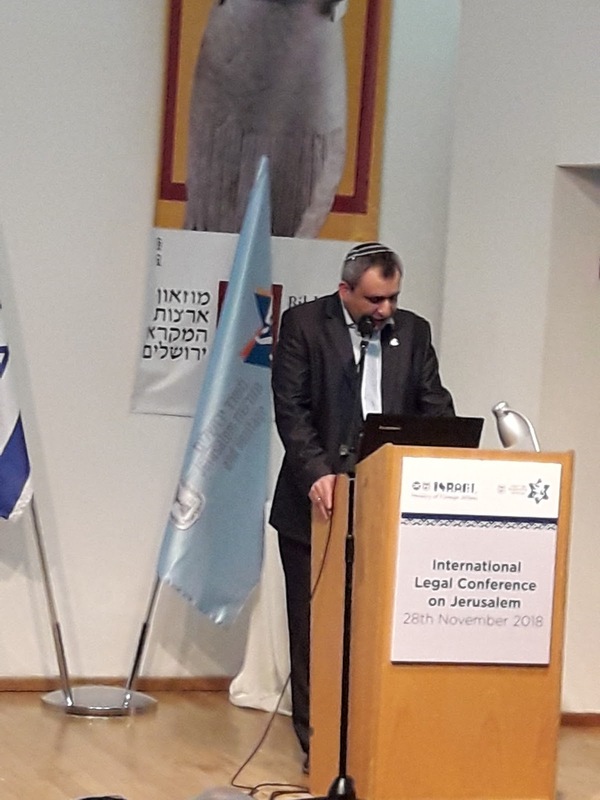 ...Initiatives that threaten the delicate historic set of relationships, rights and obligations encompassed in the ‘Status Quo’ arrangements risk further destabilization of the situation in Jerusalem and the Holy Land. The Executive Committee calls on the Government of Israel to stop and refrain from any such initiatives that may upset this important foundation for inter-communal relations in the city and region. In researching some material, I came across a name I was unfamiliar with. 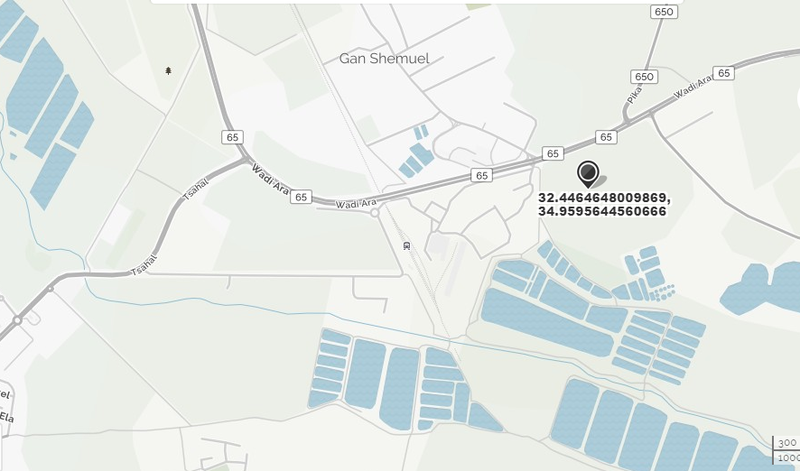 According to what I found here, she was born in 1902 in Grodna, now Belaurus. Her parents were Hillel and Zeledka Staneitzky. She had grade-school education. 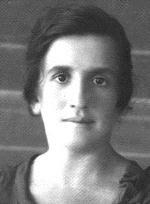 In 1922, she immigrated to Eretz-Yisrael and worked in Karkur, near Hadera (today Karkur is part of Pardes-Chana). In 1925, she married Moshe Badash, son to one of the founding families. A year later their daughter Chana was born. On November 11, 1929, while on her way back from Hadera to Karkur in the wagon driven by Yeshayahu Levitt after grinding her wheat, the two were attacked by Arabs from the village of Cherkes [Khirbat al-Sarkas] formerly located south at what is now the junction of Highway 65 and Road 650 near Gan Shmuel. Fania jumped from the wagon and attempted to escape. Levitt, despite slashed on the arm with a sword, fled towards Hadera and called for assistance. Fania was caught by five attackers who shot her and then stabbed her to death. 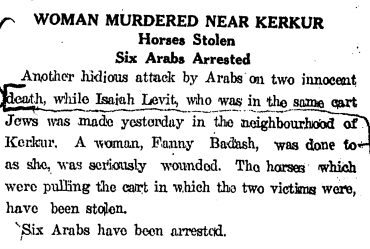 According to Davar of November 13, the time of the attack was around 5:30 and the attackers were from a Bedouin encampment near the village. The paper noted that Fania had been "shechted". The day before on November 10, Dr. Albert Avraham Ticho had been set upon and severely wounded by Arabs wielding knives in Jerusalem. 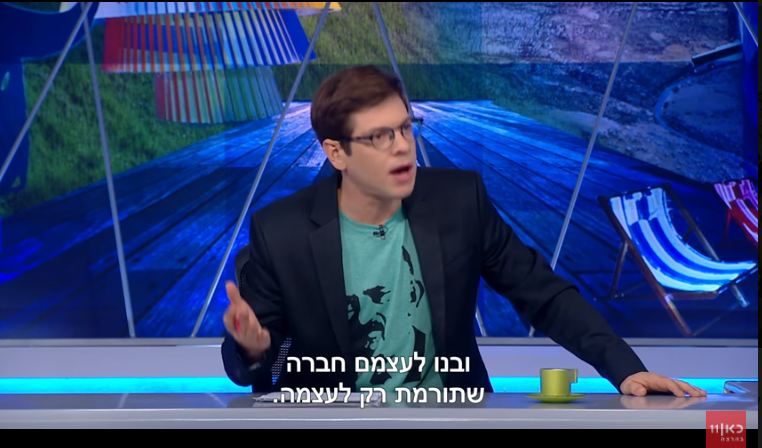 Professor Erekat, Where'd "Israel" Go? 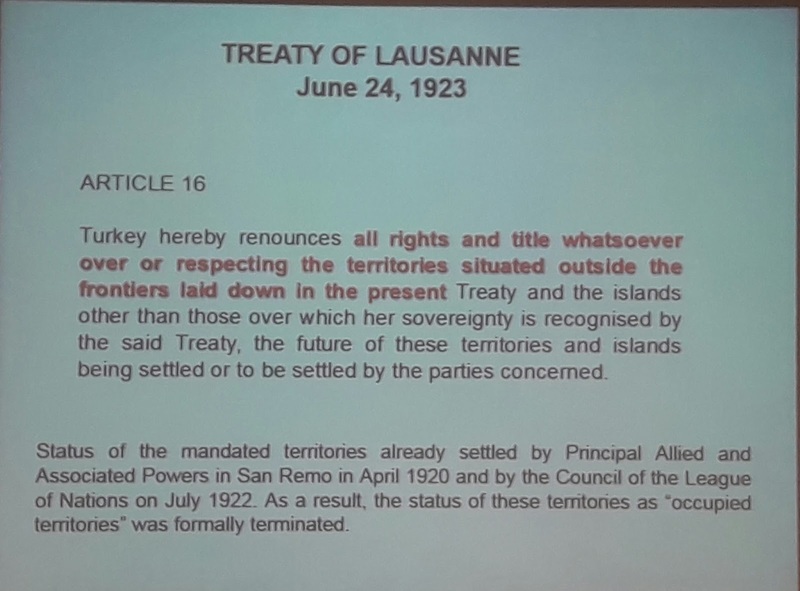 How Important is a Signed Peace Agreement? How Bad Was Ms. Hotovely? Hillel At Princeton: On the Roof? Maybe A Smirky Laugh, Too?